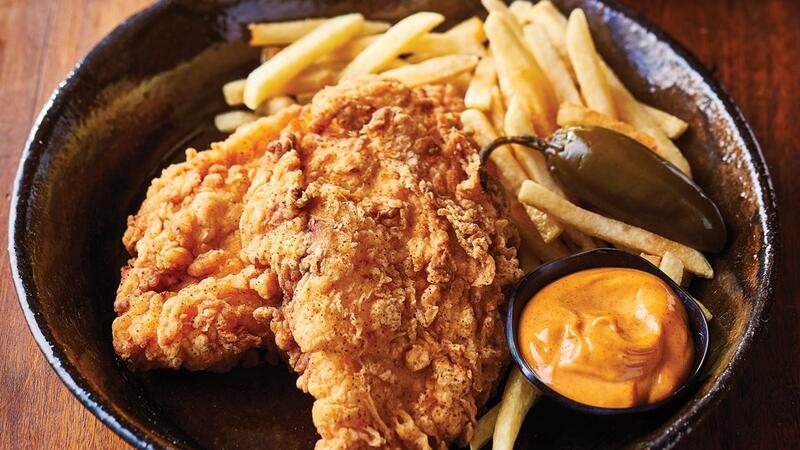 Who doesn’t love southern fried chicken schnitzel? An all-time favourite, this classic chicken recipe goes perfectly with a spiced dip that fuses smoky barbeque sauce with a unique South East Asian spice paste. In a mixing bowl, mix well Chicken Seasoning Powder and buttermilk. Add in chicken breast into the mixture and marinate for 4 hours. After 4 hours, pat dry chicken, set aside and reserve the buttermilk mixture. In a mixing bowl, mix all the dry ingredients together and add in whole egg to form a batter. Coat chicken with the batter and deep fry at 160 degree Celsius for 7 mins. In a mixing bowl, mix well RealMayonnaise and Hickory Smoke Barbeque Sauce and SEA Spice Paste. Portion the sauce into the ramekin bowl at 50gm each. Deep fry the fries to golden brown, plate the chicken with fries and sauce.